We’re glad that there are many different types of summer camps available to those who want them. If your kid has their heart set on a career in music, band camp might just be the answer. And if they’re a big FIFA fan, we won’t be surprised if they head to soccer camp. But for most kids, they’re going to need more variety in their summer so that they don’t get bored with a particular activity. Luckily, our summer camp provides kids, no matter their interests or talents, with activities that they’ll be wanting to come to day after day. We’ve put together some great activities for all kids between the ages of 7 and 14. 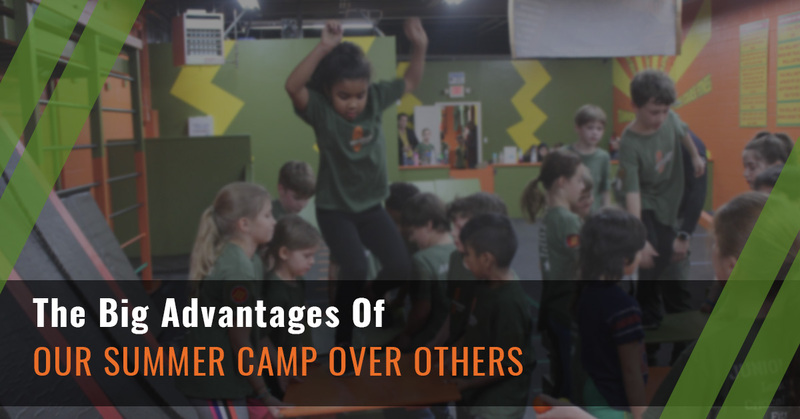 Here are a few more advantages that our Leadership Summer Camp has over many other types of day camps. We fully realize how hot it gets here in Illinois in the summer. But we also know how important it is for kids to get up and exercising, whether they’re in our kids’ gym or out in nature. Kids need to move during summer, because when they’re at home in the air conditioning they’re not even getting a recess break as they would when they’re at school. We get kids exercising indoors and out. A little sunscreen plus a lot of water and they’re good to go! You know what? Without a doubt we have the greatest variety of any type of day camp out there. Sure, we go on field trips like other camps, but there’s also hiking, first aid training, cooking, orienteering, archery, self-defense, beach time, outdoor exploring, parkour, and many other activities that the kids never get tired of. Of course, there’s also the obstacle course fitness that comes from our kids’ gym. Considering how interests can change even over the course of just one summer, many kids might get bored with the same topic for the entire summer. But with the variety we offer, they’ll be clamoring to head to our day camp every day. There are some camps that are going to require a screen, like if you send your kids to Coding Camp. But in general, kids are getting enough screen time in their lives, and it’s important to remind them that not every activity requires a monitor or tablet in front of them. We like to brag that there’s no wi-fi at Hot Ground Gym or our Leadership Summer Camp. And the best thing is that most kids don’t even notice because they’re having so much fun. The fact is, we’re quite proud of the variety we offer the kids of Vernon Hills with our summer day camp. We’ve worked hard to make it as interesting as possible to both girls and boys with age-appropriate activities. If you’d like to learn more about our summer camp program (it starts June 12, 2017!) click here to read up on it or apply.